Motshwari was confirmed amongst nine new signings by the Buccaneers on Monday, as they look to strengthen their squad for what is expected to be a gruelling season both domestically and on the continent. The 27-year-old midfield workhorse spent four seasons with The Clever Boys, and leaves behind treasured memories and relationships with his former teammates, amongst them Ntshangase. The two shared a strong bond, often being spotted together during and after training, as well as at events outside of their club duties, with the duo both being sponsored by adidas. Ntshangase says he was hurt to learn of his older ‘brother’ Motshwari’s departure from Milpark, while highlighting their journey together since befriending one another in 2014. “He’s not just a friend, he’s been a brother to me. I remember the first day he came to Wits. I was still with the academy but playing for the first team, he came and also stayed at the academy while trialing with the first team,” Ntshangase tells KickOff.com. “It was so emotional and painful to see him leaving now, after spending the last four years together. He grew in front of me – obviously he’s older than me but football-wise, since he got into professional football, I saw where he started and now he’s moving on. “It’s so painful because I know each and every corner of him – on the field and off the field, but on the other side I’m happy for him, because these are the consequences of his hard work and he deserves this move to a big team in South Africa. Despite playing a subdued role in his final season, managing just 11 appearances in all competitions in 2017/18, Motshwari made a total of 88 appearances for the club and was a key figure in their maiden Absa Premiership and MTN8 double in the 2016/17 campaign. His 23-year-old teammate believes his experience in winning silverware will come in handy at Pirates, who are looking to end their four-year drought without a trophy. “I think he deserves a chance to play at Pirates. 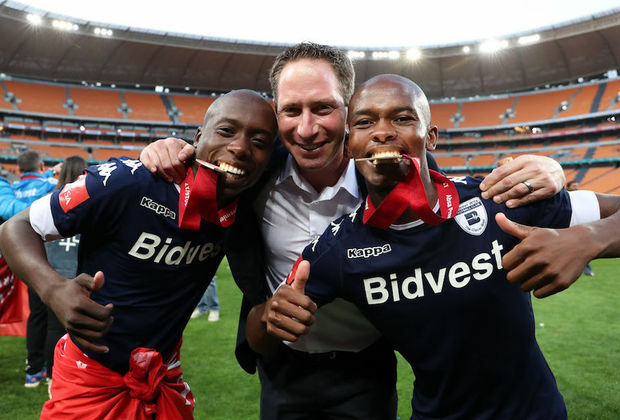 Fortunately, I’m happy that we won all the cups and everything at Wits when he was still here,” Ntshangase adds. “Because that gives them proof, should they want it, on whether this guy deserves to play for the club. The CV he carries with him now says, ‘Guys, I’m here, I’m from Wits and I’ve won this, and I can do this and that’.